This evening I didn't cook because we still had plenty of leftovers from last night's Mexican Meatloaf and Cheddar Cauliflower Mash. I decided to bump it up a notch and add a little pizzazz to make it just a wee bit different from last night's meatloaf. 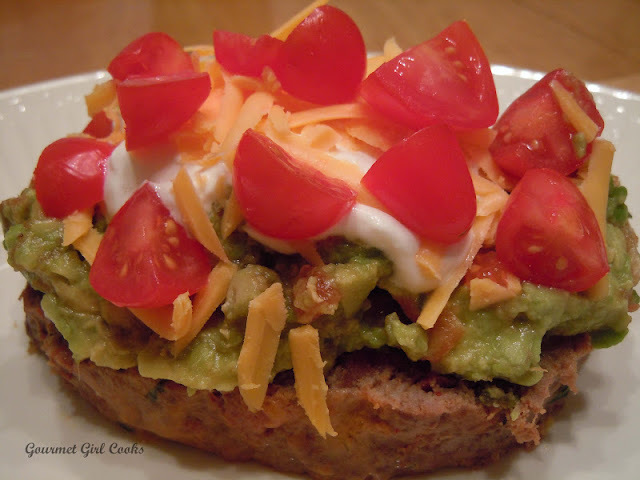 I topped my slice of meatloaf with half of a mashed avocado mixed with a little bit of salsa and then added a dollop of sour cream, shredded cheddar cheese and a few diced tomatoes. It was like eating Mexican Meatloaf on steroids! :-) I snapped a quick picture below for you to see. Enjoy!